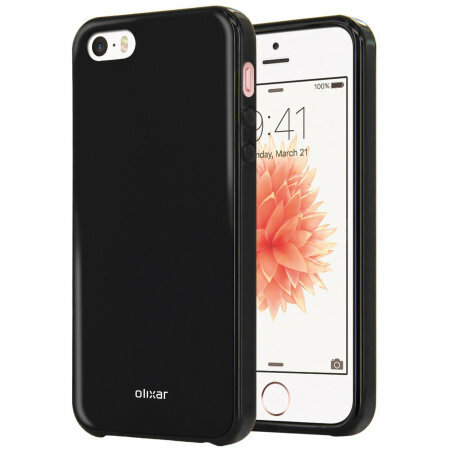 Custom moulded for the iPhone SE, this black FlexiShield gel case from Olixar provides excellent protection against damage as well as a slimline fit for added convenience. Bought a few great priced items here. Great company ???? Defective product recieved. Offered another "as a goodwill gesture". Badgered with emails after purchase. Second review I've written; maybe this one will feature? Everything was very clear, I got exactly what I wanted, I’m very happy with my purchase, thank you. Fair price, plain but does the job! Only had it for three weeks but so can't offer a comprehensive evaluation. However, it's light & yet seems to offer good protection from scratches (at least) - fortunately I haven't dropped the phone yet to really test it - & was good value. But so far, so good & I'd recommend it as an option. It should have been made clear that the case protected the back only leaving the vulnerable screen bare. accessible. There is a tiny lip all the way around the screen so the corners and sides are are safe if the phone gets dropped. Well worth the money! Great product exactly as described. This is just what I was looking for a does a good job of protecting my phone. Good value would buy again. great price and fits perfect on my phone !! Works like a charm very sturdy and looks very sensible, mobilefun are very prompt with the delivery too! The case fitted the iphone5SE perfectly. The case did not make the phone look bulky and allowed the color of the phone to be visible. Highly recommended. Excellent quality and a superb fit. I purchased this case to protect my new phone. I wanted a case that was slim so as not to add bulk but I also wanted it to provide me with a little more grip, this case does both so I am really pleased. Its easy to put on (and take off) and becuase its silicon it protects the phone against small knocks. It is really clear as well. Very nice sleek clear case. Good grip, better than I thought it might be. Hardly any SE cases available in the US glad I found this site. It was recommended by a Creative at an Apple store. Perfect case for iPhone SE! Perfect case for my new iPhone SE! It's a great fit and love that it's clear so I can show off the phone colour I chose. Easy ordering process and arrived in a timely manner. Would definitely recommend. A durable case to protect your iphone SE. I opted for the clear one as I wanted to be able to see the rose gold on my new phone. It adds a little weight to it but I wanted that so it wouldn't slip out of my hands and would be safe from the curious hands of my 5 month old baby. I've already dropped my phone since but nothing has been smashed. The case covers the volume buttons on the side and the on/off button at the top so you may need to press them a little harder but no need to take the case off to plug your earphones or charger. Good value for money and aesthetically pleasing. V pleased with the product. FYI - this product though it states it's for an iphone SE, will also fit iphone 5 and 5S. I hadn't thought of a clear case but loving the new rose gold phone colour it seemed a shame to cover it up. The case fits well, is very tactile and protective and I'm very pleased with it. Case does not mould well with phone. Buttons on case do not mould well with phone and do not activate phone connectors. I would not recommend this product. Sorry to hear you are not happy with this case. Can you please contact our Customer Services team so we can look into this for you. That apart from protecting the phone, looking good whilst being almost invisible, it also provides good grip. The phone has not flown out of my hand once since the gel case was fitted. Brilliant! do you want? Jam on it! Without a doubt this is the best cover I've had (and I've had quite a few!!). Fits perfectly and feels good to handle too without the bulkiness of previous covers. It also looks the part aswell as it blends in with the colour of my iPhone. Will definitely buy another when or if I need to! The gell case is excellent value for money and fits perfectly leaving all buttons and lenses operating as they should and as they say , does exactly what it says on the box . Bought this having read other reviews and totally agree with what has been said. Excellent product, fits perfectly. Excellent product fits like a glove and excellent website. Excellent online company to buy mobile accessories! Website easy to use, products were delivered reliably and in good condition. Customer service was fantastic. excellent purchase. It enhances the pink colour of my phone. I love this shield, it exactly matches the photos and description given so there were no surprises when it came. It protects the phone from scratches (which is what I wanted it for) and because it's clear, the phone barely looks any different with it on. I found it fairly easy to get on and now it is on, it doesn't feel like it's going anywhere. The shield makes the edges feel more rounded, a bit like the 5S. The only downside is that the buttons at the top and side need a little more pressure to push down. A really good product! Smooth quality finish, feels great around the phone, fits perfectly. Allows perfect access to charger and ear slots. Arrived several day's before expected. Liked this product so much/so happy with it purchased it twice. Would be great if the other colours had the exact same non transparent finish as the black, but as far as this product is concerned definitely recommend purchasing. Just what I asked for!! Excellent product!! Can hardly notice it's on my phone which is just what I wanted. Good value & good delivery time. Would recommend. When the cover is on the phone, my Bose IPhone dock will not work. It is quite thick plastic. But I guess that's how it protects the phone. Nice quality cover though. Makes my rose gold phone look great. I am completely satisfied with the Olixar clear case for my Rose Gold iPhone SE. It's a perfect fit and the beauty shows through while protecting the finish of the device. I love the rose gold color on my new iPhoneSE and I wanted to protect the phone but still enjoy it's beauty! The crystal cover I found seemed perfect and was very reasonable. It arrived quickly and fit well and I love enjoying the look of my phone and also having it protected and easier to handle because the case is less slippery than the phone! A great experience! Good quality feel and can still see the phone which I like. Delivered on time. Just what the doctor, well this time nurse, ordered. Bought as a gift for a sometimes clumsy girlfriend. A high quality product that fits like a glove. I love my new FlexiShield iPhone SE Gel Case! I got the clear one and it lets the beauty of my gold phone shine through. When I first got a request for a review I had not yet received the cover for my iPhone. I was not aware it was being shipped from UK. That should be on the order so a person will expect more time for arrival. That being said, I did finally receive it and it is exactly what I expected, and I love it. Thank you! This is a simple and sleek rubber case, that does the job without putting any bulk on the phone. As a fan of the original iPhone design, I needed something minimal for the protection of the phone ... there is not a better product, for such a great low price. This is one of the better cases I have purchases over the years. Especially for the price. All buttons work exceptionally well along with speaker and plug in openings. Can't go wrong. Bought this gel case & really pleased with it. Fast delivery it came the next day. The little iPhone 6se is too small and slippery to hold and text easily but the Otterbox made it too big a a think. This little gel case is perfect. It protects the phone and males it comfortable to use. I really love this case as I often need to remove it to plug in to my cars blue tooth and it easily comes off with no hassle. It's a simple and light protector although don't try to take it on and off (no need to really) as this could stretch the plastic. I'm also getting a clear screen protector for the front. Easy to plug in the phone as the holes are all in alignment! Nice tactile non slip feel. If you want something subtle this is it ! Good value gel case which fits iPhone SE perfectly. Makes holding the phone safer with a non slip surface. The button covers fit well and the holes for speakers are accurate with no problems fitting charger or headphones. All in all very pleased with the quality for the price. Exactly what I expected. Clear case, fits phone perfectly. Much easier to hold phone and use with case on it, but didn't want to 'cover' the phone. This case is perfect - protection yet minimal intrusion on look of phone. This case was exactly what I wanted: Clear, so you can see the phone as Apple intended. Slightly soft so it is not too slippery, and also protective. Fits the phone well. All controls operable etc. It was also very reasonably priced and it arrived fairly quickly. I would certainly use this vendor again. I bought three of these phone cases for my phone and my two kids. For the price, I figured I couldn't go wrong. All my other cases hid the beauty of the iPhone. This simple, strong and clear case not only shows off the phone (as was intended with the design) but also protects the phone perfectly. I also have a glass cover on the screen and the case does not interfere with it. The only minor (very minor) issue is that the plastic is somewhat stiff, so pushing the buttons is a little harder than with most cases. These cases are so much better than the price might lead you to believe. Even my teenage daughters are loving them. For the price, this is the best clear iPhone SE case out there. It's simple but gets the job done, protecting the sides and backs from scratches and accidental drops. The fit is snug and adds no extra weight or bulk to your phone. The two volume control buttons become a little difficult to press down through the case, which can be especially annoying when trying to use them to snap photos, but other than that, this is a great clear case. I take my phone almost everywhere and drop it often, so I was looking for a single piece simple wraparound protective case for my phone. I've had this case for about a month, and it has been great! Also easy to clean. I am not much of a case person, as I really enjoy the aesthetics of the classic iPhone and its design. However, after dropping the phone and making a substantial mark, I know I had to get something. I still wanted the sleek nature of the phone, so a goo thin case was on my mind. I decided to try the FlexiShield as it was the least expensive, and I could not be happier!!! it keeps the slim nature, it comes on and off with ease and you can clean it with soap and water easily. I highly recommend this case if you want a simple and clean look for a great price!